The latin america infusion pump market is expected to be valued at USD 487.3 Million in 2016. This latin america infusion pump market is expected to grow at a CAGR of 6.6% during the forecast period (2016–2021) to reach USD 671.9 Million by 2021. Growth in latin america infusion pump market can mainly be attributed to factors such as increasing prevalence of chronic diseases owing to the rapidly growing geriatric population, increasing use of infusion products in homecare, and technological advancements in infusion pumps. On the other hand, factors such as the economic slowdown, stringent regulations for product approval, and medication errors associated with infusion pumps as well as related product recalls in the recent past may restrain the growth of the latin america infusion pump market during the forecast period. On the basis of products, the infusion pumps and accessories market is segmented into infusion pumps (devices) and infusion pump accessories. 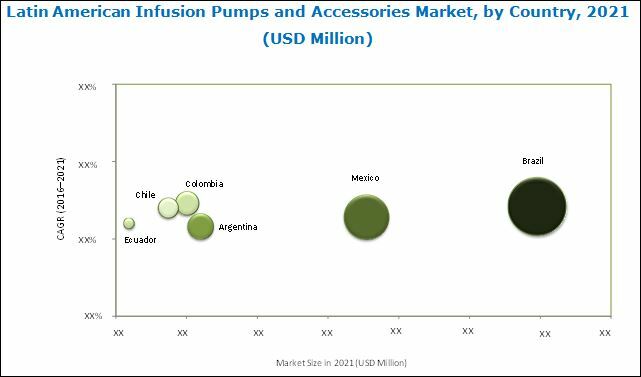 Infusion pump accessories (comprising dedicated and non-dedicated disposables) accounted for the largest share of the latin america infusion pump market in 2015. This segment is expected to grow at the highest CAGR during the forecast period. The latin america infusion pump market is further segmented into volumetric pumps, syringe pumps, insulin pumps, enteral pumps, ambulatory pumps, patient-controlled analgesia pumps, and implantable pumps. The increasing demand for insulin pumps and ambulatory infusion pumps are driving the demand for these pumps mainly due to the increasing prevalence of diabetes, cancer, and chronic diseases in this region. Ambulatory infusion pumps, such as disposable pumps and chemotherapy pumps, enable mobility of patients during their treatment, owing to which they are increasing being preferred in home care applications. In 2015, Brazil accounted for the largest share of the latin america infusion pump market, followed by Mexico and Argentina. The large share of the Brazilian market can be attributed to the high prevalence of chronic diseases, rising penetration of smart pumps, high adoption of ambulatory pumps in the management of chronic diseases, and well-established healthcare infrastructure in the region. Argentina, Colombia, and Chile are expected to offer significant growth opportunities for market players in the forecast period owing to the large patient population, increasing incidence of chronic diseases with changing lifestyles, increasing accessibility to advanced products, improving healthcare facilities, and increasing disposable income of the middle-class population. The major players in the latin america infusion pump market are Becton, Dickinson and Company (U.S.), Baxter International, Inc. (U.S.), Hospira, Inc. (U.S.), B. Braun Melsungen AG (Germany), Fresenius SE & CO. KGaA (Germany), Medtronic, Inc. (U.S.), Smiths Medical (U.S.), Terumo Corporation (Japan), Moog, Inc. (U.S.), and Johnson & Johnson (U.S.). Other players include Roche Diagnostics (Switzerland), Nipro Corporation (Japan), JMS Co., Ltd. (Japan), Acromed A.G. Medical Systems (Switzerland), KD Scientific (U.S.), Caesarea Medical Electronics (U.S.), New Era Pump Systems, Inc. (U.S.), Micrel Medical Devices SA (Greece), and Zyno Medical (U.S.). This research report categorizes the Latin American infusion pumps and accessories market by product, application, and patient care settings. These markets are further broken down into segments and subsegments, with value analysis provided for 2014, 2015, and 2016, as well as forecast for 2021. Each market is comprehensively analyzed by country (Brazil, Mexico, Argentina, Colombia, Chile, Ecuador, and the Rest of Latin America) to provide in-depth information on the regional scenario. The latin america infusion pump market is projected to reach USD 671.9 Million by 2021 from USD 487.3 Million in 2016, growing at a CAGR of 6.6% during the forecast period. latin america infusion pump market growth can be attributed to the increasing prevalence of chronic diseases owing to the rapidly growing geriatric population, increasing use of infusion products in home care with favorable reimbursement coverage, and technological improvements in infusion products. However, the presence of stringent regulations for product approval and the occurrence of several cases of medication errors associated with infusion pumps (and related product recalls in the recent past) may restrain the growth of the Latin American infusion pumps and accessories market during the forecast period. Product innovations focusing on improving the safety features of infusion pumps are at the center of R&D efforts from leading players in latin america infusion pump market. In this report, the latin america infusion pump market is segmented by product, application, and patient care settings. On the basis of products, this market is mainly segmented into infusion pumps and accessories. The infusion pumps market is further segmented into volumetric pumps, syringe pumps, insulin pumps, enteral pumps, ambulatory pumps, patient-controlled analgesia pumps, and implantable pumps. The latin america infusion pump market, by patient care settings, is segmented into hospitals, home care, ambulatory surgery centers, and others. The hospitals segment accounted for the largest share of the Latin American infusion pumps and accessories market in 2015. In 2015, Brazil accounted for the largest share of the latin america infusion pump market, followed by Mexico and Argentina. Countries in Latin America, particularly Brazil and Colombia, are expected to offer significant growth opportunities for market players in the forecast period. This is mainly due to the high patient population and rapidly aging population in these countries, high incidence of chronic disease, rising per capita income, and improving healthcare infrastructure in this region.